On 17 June 1917, residents of a small Suffolk village witnessed the dramatic destruction of a German Zeppelin. Attacked by three British home defence pilots, L48 fell in flames on Holly Tree Farm, Theberton with the loss of all but three of her crew. The burnt-out wreck of the airship was visited by thousands for weeks afterwards and many fragments of her structure were distributed both officially- and unofficially! In the Summer of 2006, the crash site was excavated by a team of aviation archaeologists who uncovered a number of fascinating artifacts from the Zeppelin as part of a BBC2 Timewatch documentary which first aired in January 2007. 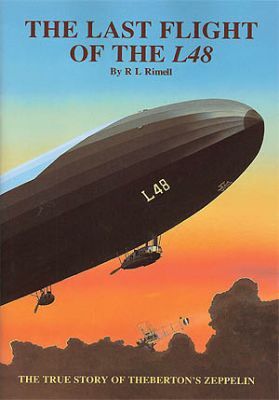 In advance of the broadcast, author/illustrator Ray Rimell, who acted as a consultant for the programme, presented this fulsome account of the day L48 fell to earth with the aid of rare archive photographs, exclusive colour plates and artwork, together with scale plans of L48 and newly-researched colour profiles of the three British aircraft involved. Many eyewitness accounts, official records and archives - both in Germany and Britain - were utilised to produce a truly unique document of this momentous wartime event.